catering to a multitude of societal and industrial needs. Regulatory, sustainability and consumer forces have been constantly shaping the business fundamentals of this industry. Developing value creation strategies, which embed economic, environmental and social sustainability components, will need a comprehensive assessment of business, scientific and technological challenges facing the industry. 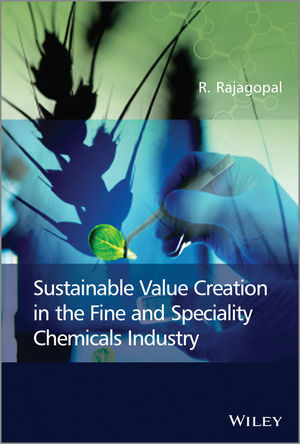 Sustainable Value Creation in the Fine and Speciality Chemicals Industry assesses sustainable value creation options against the backdrop of global mega trends that are defi ning the present and future course of the industry. It discusses innovative strategies in feedstocks, R&D, technology, manufacturing, resource management and the supply chain as well as the significance of the bio-based chemical economy in enabling sustainable value creation in the fine and speciality chemicals industry. overview of strategic options for sustainability management in the global fine and speciality chemicals industry. It will be a valuable resource for chemists and chemical engineers involved in the design and development of economically, environmentally and socially sustainable practices for the future.